I know I'm probably in the minority here, but I wanna keep him. But it looks like he's not gonna be around for much longer. Hopefully we can at least get a draft pick for him. The writing is on the wall for McCoy. Great player just not the same guy he once was. This year his play slipped and was not consistently winning his one on ones. Seems like if he does not get a good jump his disruptiveness is done. 13 million is just too much and with Vea here he is expandable. Not sure who is willing to take on that contract via trade but its safe to say he is gone. And I wish him the best wherever he lands. I bet the Falcons try to pick him up. He’d be a good fit in NE or SEA too. All that money he has made I bet Gerald goes to a winning culture. He needs a change and so does this team. Best for everyone to part ways. I think it's time to move on. Honestly, Vea was more productive in his time then it seemed GM was. Probably not in actuality but it did seem that way. Vea only going to get better and he is already an upgrade over GMC. He cost too much and he not the same player anymore. McCoy is not a bum by any means but we could use his 13.5 mil on a new CB to replace Grimes or that money can be used for a top flight MLB. CJ Mosley comes to mind. Its a young mans game, McCoy will never be an elite DT again at this point. Might as well get some younger, cheaper fresh legs in there to fortify the DL. JPP time is soon coming to an end but as you can see, even with injuries he is still out working and producing folks. McCoy being banged up all the time took a toll on his body and us never taking him out of games lead to that. Hopefully we manage Vea much better and it starts by adding depth. Good thing this is a deep DT class. If they could restructure GMC down to Curry s number around 8 million, then I think he stays. Curry will be gone. 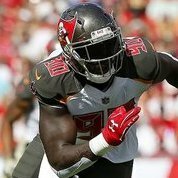 I envision Vea and McCoy 5 technique starters. I would cut Allen and Unrein and get a true 3-4 NT, then priortize drafting another 5 tech in the draft. There is going to be a decent supply of interior dline on the free agent market, hopefully GMC is willing to take a reduced salary, I m not sure he would do better then 8 million on the free agent market with Suh and Richardson also UFAs. I m cutting Gholston, Curry, Allen, and Unrein already. Cutting GMC would be the 5th, that s a lot of roster spots to cover in one offseason for one position group.